Very nice hostel. Clean, comfortable beds, lots of solo travels, good food and very nice staff. I would absolutely stay here again if I came back to Havana. Really helpful staff and really nice atmosphere. BEST hostel for solo travelers! Living room area is perfect for meeting people, mostly everyone there was alone too! Made tons of groups to go out in the day/night. Very sweet staff. They give you freshly made juice when you check in! Very comfy rooms and clean bathrooms! A little far from old Havana and DT but a $5-$10 taxi ride away. Or 30 min walk. 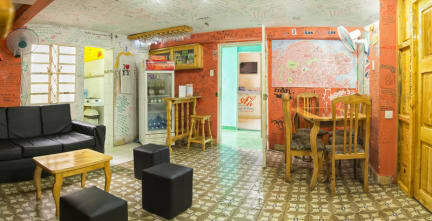 Nice hostel in Havana! Good location in Vedado with a walking distance to Malecon. They serve good food there too and we had a couple of great dinners there. When the staff was asked for information about going to other cities, like buses, taxis or casas de familia, they only showed expensive options. I wanted to go to Viñales, and asked them which was the cheapest option, and they told me to get a shared taxi, that they would book. But there is a cheaper bus that is sold in “Plaza Hotel”, but they chose to omit the information about the bus! And when I told other guests about what I had found out, the staff was angry at me and was very impolite. I have stayed at a few hostels around Cuba and also in another hostel in Central Havan when I first arrived in Cuba. Although the staff are friendly here, the facilities are not great. The bathroom was quite dirty and door would unlock! The main issue I had was that the place was so so noisy. You can only really get 4 hours sleep here each night. It's fine for night 1 or 2 in Havana, but not great for the later part of your trip. Ideal for 18 to 25 y.olds only.